Hot on the heels of the Summer Solstice, the full moon in Capricorn has waxed gravid over the horizon – a supermoon to boot, pregnant with all the intensity and magic of a grand water trine (Sun in Cancer, Saturn in Scorpio and Neptune in Pisces). The Algonquin tribes called the June full moon the Strawberry Moon, because this is the month when the ripening fruit can be harvested. (My own ripe strawberries have all been harvested prematurely by some vermin bandits, alas!) In Europe (where strawberries aren’t native), the June moon is known as the Rose Moon. 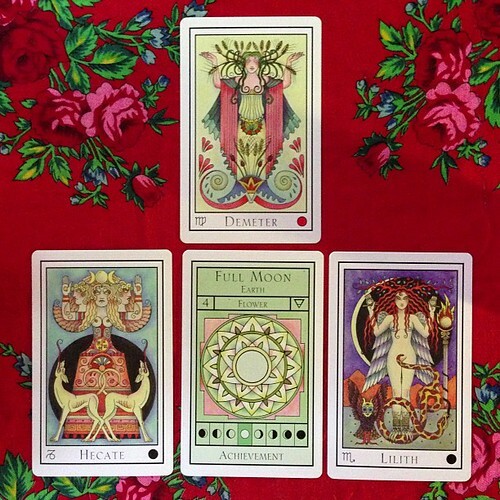 Hecate, Lilith & Demeter: powerful cthonic goddesses to guide us on this earthy full moon. 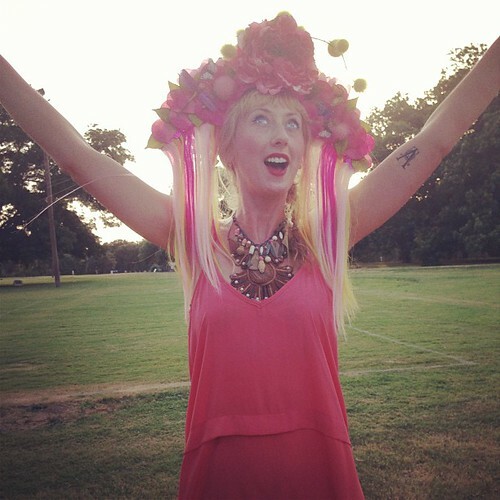 Miss Allyson Garro in her solstice head-dressed glory, welcoming in the summer… All hail the Queen of Summer! Queen of Pentacles + The Empress – channeling their abundance, creativity, stability, and sweetness on this full moon in Capricorn. This is a time of abundance, of summer’s brilliant zenith, where the bounty of fruits and flowers brings sweetness to our eyes, our tongues, our noses. Honeysuckle and passionflower twine in my garden, and this year I harvested ripe plums and nectarines from the fruit trees planted years ago. 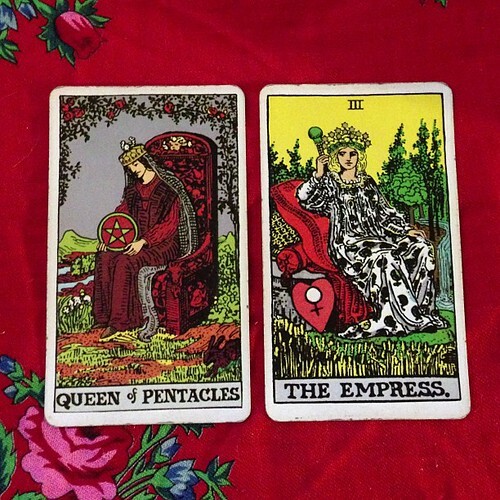 The Queen of Pentacles and the Empress both remind us to plant those seeds, to nurture the things we want to flourish in our gardens, and to weed out what we don’t. 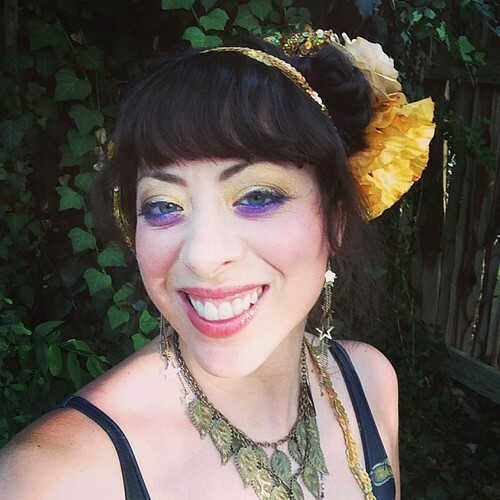 These powerful archetypes both represent the Earth Mother, the divine feminine force, the ultimate Creatrix – manifested both on the celestial plane and on the earthly. These energies can inspire us to be independent, strong, and peaceful in the homes and workspaces we create for ourselves. To know and trust completely that we can provide for ourselves (and our children, if we have them). Think of the deep pride you might feel in being able to bring home your own bacon, in tenderly feeding your hungry baby bird (be it yourself or another), in maintaining a tranquil and beautiful place to live. This is a good time to take care of yourself, of your body – to cook good food that you grew yourself. This is strong magic. Pre-solstice parade happiness. It’s crazy, you know – I’ve been realizing that it’s been almost a year since my life fell apart, and I couldn’t imagine then that I could ever really be happy again. So much has changed in my life, and yet the constants are a comfort. I have come through the slaughter, still remembering how to smile. Last year’s Full Moon in Capricorn was not so kind to me, and I’m grateful to report that this year’s has been far more gentle. To me, at least – though so many people I love dearly are having a really hard time right now. I’m focusing on sending them strength, and the knowledge that a year can change a lot of things. 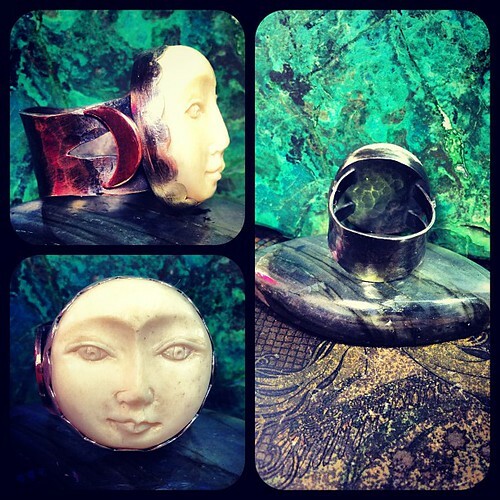 I made this full moon goddess ring as a gift for my stepmama! She has a carved bone luna face, made from sterling silver, with copper crescents. 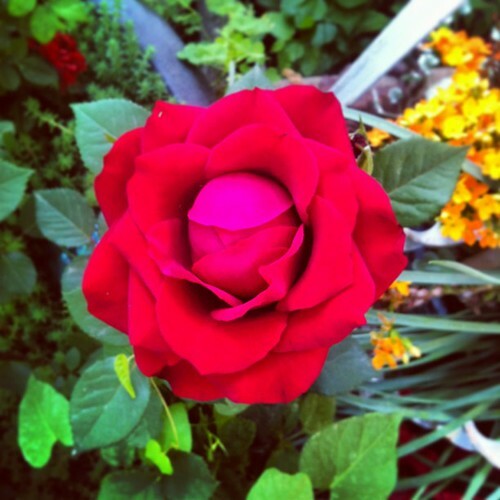 A perfect red rose, growing in my garden. 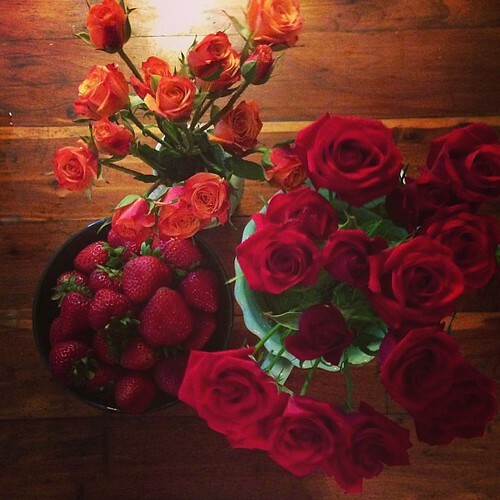 Happy Strawberry Rose Full Moon in Capricorn! 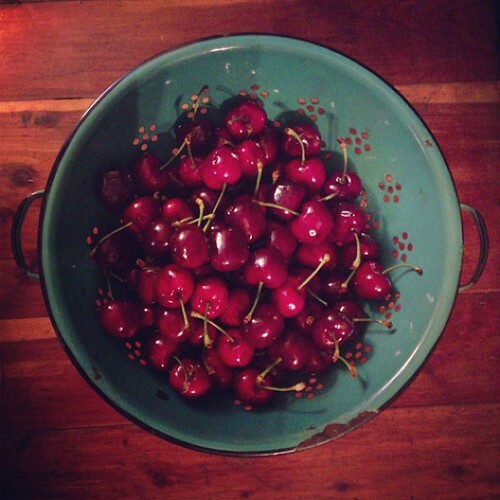 Life certainly is feeling like a bowl of cherries today – I got completely distracted from posting this earlier this week as I’ve been captivated by the goings-on in our State Capitol this week. Last night’s incredible feat of filibustering and explosive energy from the democratic politicians here in Texas, who were joined by the fired up citizens of Austin when they showed up in droves at the dome to shut down Senate Bill 5, and roar that we will not stand meek in the face of the GOP’s dirty war against women. 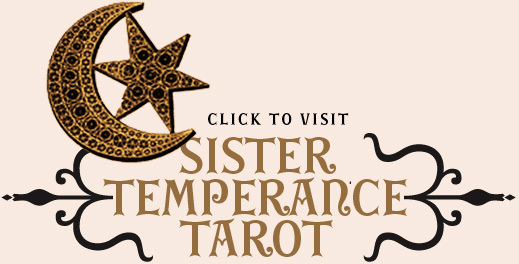 Talk about Queen of Pentacles and Empress energy! Senator Wendy Davis of Fort Worth, Texas instantly became the hero of so many of us here in a state that is all too often seen as nothing more than a hateful backwater filled with hicks and idiots. She is the ultimate fierce warrior queen defending our constitutional rights with her strength, bravery and grace (and fabulous hair!). Huge love to Senator Leticia Van De Putte also for her huge heart and hard work, standing up to her male colleagues and making her voice heard. Not only that, but upon waking we discovered that not only had SB5 been defeated, but that also that the Defense of Marriage Act had been killed! Today is a great day for equality, and for activism – and this is only the beginning of the fight. Stay strong, stalwart sisters! Savor the sweet fruits of your labors, and the taste of victory! 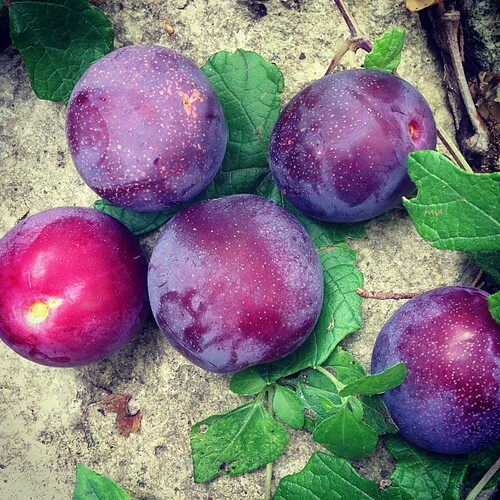 The plum tree planted seven years ago finally decided to bear fruit! 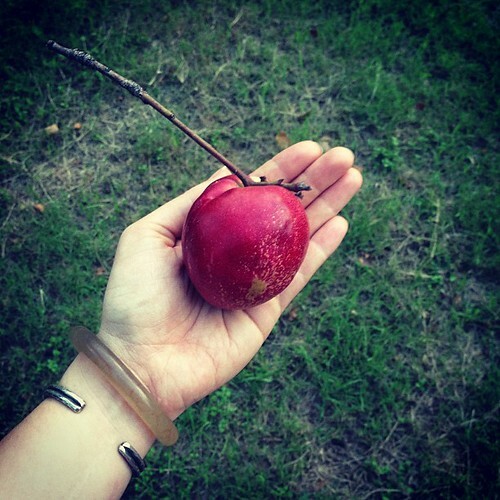 They are incredibly juicy and delicious! So excited about this development. 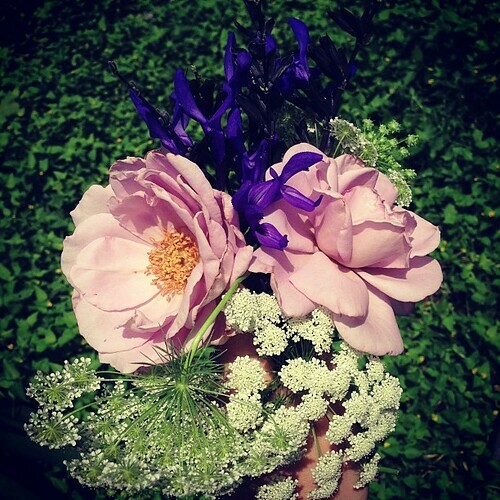 A bouquet from my garden: Violet’s dead baby girl roses, black & blue sage, Queen Anne’s lace. 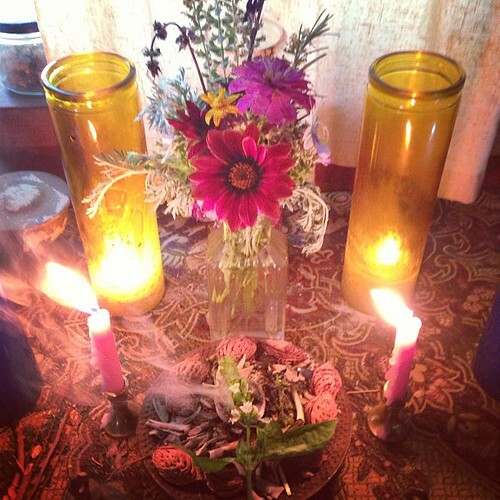 I hope your Summer Solstice, and the recent full moon has been treating you kindly, and that your life is full of sweetness, and that all the good things that you are working on come to fruition. What did you do to celebrate? What seeds are you planting for the future?